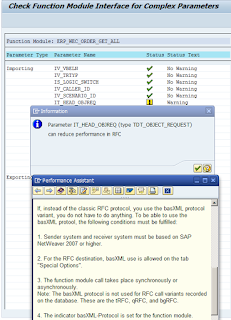 In case there is an integration scenario for which a function module (FM) is exposed to external applications an performance point of view is important to be considered. It may happen that the FM with complex interface occurs performance issues. What is meant by complex interface? Basically if there are any complex or nested data types within IMPORT/EXPORT/CHANGING parameters of the FM. Complex data types - are made up of other data types. A distinction is made here between structured types and table types. Nested structures – are structures that in turn contain one or more other structures as components. 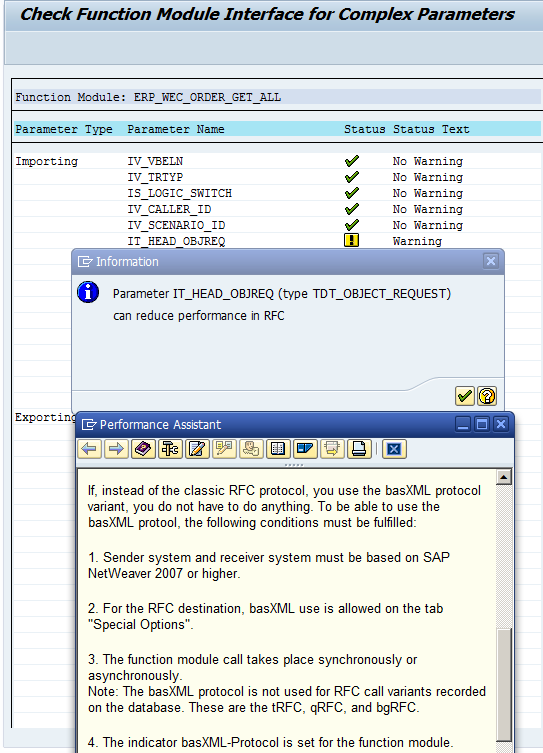 To identify the FM which may have performance problem you can use report RSRFCXC. The report should be used before exposing the FM. Output of the report is evaluation of every FM’s parameters whether it may have a problem and also how to correct it.